When worn-out hoses fail or don't work, it becomes very clear how important those inexpensive parts can be. 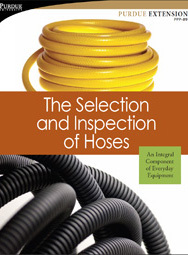 This publication describes design characteristics to look for to correctly select a hose, and offers inspection guidelines to determine when a hose, clamp, or fitting should be replaced. Target Audience: Pesticide applicators, agribusinesses, agricultural producers.